New report from local think tank turns back the clock on this important matter by calling for Rhode Island to repeal its renewable-energy mandates and let the free market solve this complex issue. The scientific consensus worldwide is that certain human activities, most notably the burning of fossil fuels, are negatively impacting the climate and, thus, the planet. The only parties who insist on debating established science are the fossil-fuel industry, think tanks financially supported by the fossil-fuel industry and those who worship the status quo. It’s difficult to have an open and honest debate when a report employs such an argument. No area of the globe, Rhode Island included, operates in a vacuum. The world is connected by a complex and often-fragile web. Ocean currents, for example, allow for milder weather in parts of Europe where the latitude would suggest otherwise. Air pollution emissions, created mostly from the burning of fossil fuels in Illinois, Indiana, Kentucky, Michigan, North Carolina, Ohio, Tennessee, Virginia and West Virginia, are carried by prevailing winds into Rhode Island. Powering our way of life comes with consequences — public health concerns, social injustices and environmental damages — and wind and solar energy won’t change that unfortunate fact. But an energy portfolio that encourages the use of renewables and a power grid that can harness this energy would without a doubt help lessen the impact of mankind’s voracious appetite for power. The methods used to extract fossil fuels — drilling, hydraulic fracturing, and mountaintop removal and tar sands mining — by definition cut through pristine landscapes. The mechanisms of the fossil-fuel industry most assuredly endanger birds and bats, and cause pollution — eye and otherwise. Strictly in terms of dollars and cents, renewable energy at this moment is more expensive to produce, store and transmit, but much of that discrepancy can be attributed to outdated infrastructure that was built around the needs of the fossil-fuel industry. Stenhouse and the report’s authors believe the free market should drive energy policy. Their call for such a free-market approach would be fair if the playing field were level. But generations of government subsidies built the fossil-fuel industry’s bloated war chest. The game is rigged in its favor. How do we effectively introduce renewable energy into the game when the playground bully and his minions won’t pass the ball? Mandates — at least until the renewable-energy sector catches up and the power grid transformed — are needed if an honest game is indeed the goal. Credible estimates of U.S. fossil-fuel subsidies range from $10 billion to $52 billion annually, according to Oil Change International. Efforts to remove small portions of those subsidies have been continually defeated in Congress. A 2011 study by the consulting firm Management Information Services Inc. found that between 1950 and 2010 oil, natural gas and coal received $369 billion, $121 billion and $104 billion (2010 dollars), respectively — or 70 percent of total U.S. energy subsidies in that 60-year period. The report found that non-hydro renewable energy — primarily wind and solar — benefited from $74 billion in federal subsidies, or 9 percent of the total. Nuclear power received $73 billion (9 percent), and hydropower $90 billion (12 percent). For a more-recent time period, a 2009 study by the Environmental Law Institute assessed the size and structure of U.S. energy subsidies from 2002 to 2008. The study estimated that subsidies to fossil fuel-based sources totaled $72 billion and subsidies to renewable energy totaled $29 billion. The Rhode Island Center for Freedom & Prosperity's assumption that coal and natural gas are the least expensive sources of electricity conveniently ignores public health and environmental costs. The report solely focuses on bank-account health, because, as Stenhouse said, those other costs still need to be debated. A 2010 report by the National Academy of Sciences claims that burning fossil fuels results in about $120 billion annually in health-related costs. Stenhouse, who also is the CEO of the think tank devoted to advancing free-market solutions to public policy issues, said he isn’t against renewable energy. He just believes the renewable-energy standards (RES) the state enacted a decade ago have proven costly to average citizens who are up against the power and influence of well-funded environmental groups. The recently released report, entitled “The Economic Impact of Rhode Island’s Renewable Energy Standard: How Energy Mandates Will Harm the Economy” and published in cooperation with the Beacon Hill Institute (BHI) at Suffolk University in Boston, points out the adverse impact of Rhode Island’s 2004 Clean Energy Act on the state’s economy. It claims a number of assumptions used at the time to support the mandates haven’t come to fruition. Many of the assumptions used to justify the act turned out to be largely inaccurate, with only limited benefits, if any, Stenhouse said. Among the assumptions the report alleges are off the mark include projections that renewable energy would be more cost-efficient, renewable energy would be abundantly plentiful, fossil fuels would become increasingly expensive, and renewable energy would spur a boom in green jobs. If the General Assembly is willing to consider reforming the existing RES laws, Stenhouse’s organization recommends the state enact the Electricity Freedom Act, repeal the state’s renewable-energy standards, and require that the state investigate and utilize methods of predicting and tracing the economic effects of renewable-energy standards prior to renewed implementation. The proposed Electricity Freedom Act (page 14 of the study) repeals Rhode Island’s requirement that electric distribution utilities and electric services companies provide 16 percent of their electricity supplies from renewable sources by 2019. The report, however, looks at renewable energy through a single lens — financial cost to ratepayers. Cost certainly needs to be part of the energy discussion, but it can’t dominate the conversation. The report makes no mention of energy efficiency or smart technology. It distorts and/or dismisses the other factors — social justice, public heath and environmental protection — necessary for an open and honest discussion about energy. Proponents of the current RES law say the study picks and chooses information that fits the authors’ argument, and they claim the authors ignored studies and reports that counter their claims. For example, they note that energy costs have been high in the Northeast for several decades, because the region is at the end of the distribution system for gas and oil. Also, many states, including those in the Northeast, are or are planning to spend billions on fossil-fuel infrastructure — natural-gas pipelines, electric transmission lines and distribution expansion — and ratepayers have or will see increases in their bills to fund this work. Larry Chretien, executive director of Energy Consumers Alliance of New England, took exception to many of the study’s findings, most notably the report’s claims that fossil fuels continue to be less expensive and that the renewable-energy sector isn’t creating jobs. Chretien noted that natural-gas prices were much higher just a few years ago, after Rhode Island passed its renewable-energy standards. “Who knows where NG prices will be ten years from now? We should have a diverse energy portfolio. Wind and solar reduce our dependence upon NG,” he wrote in an e-mail. He also defended the sector’s ability to create jobs, saying such employment opportunities are increasing all over the country, most notably in Massachusetts. The recently released National Solar Jobs Census by The Solar Foundation, an independent nonprofit solar research and education organization, found that the U.S. solar industry employed 142,698 people in 2013. That figure includes the addition of 23,682 solar jobs over the previous year, representing 20 percent growth in employment since September 2012. Solar employment grew 10 times faster than the national average employment growth rate of 1.9 percent in the same period, according to the report. Massachusetts ranked fourth in the nation with 6,400 jobs in the solar industry last year, according to the report. The foundation claims the number of people employed manufacturing and installing solar energy grew by 1,900 in 2013 — a 42 percent increase. This job growth coincided with a doubling of Massachusetts’ solar capacity last year, to 425 megawatts. Environment Massachusetts released a report in 2013 which emphasized that it’s not the availability of sunlight that makes states solar leaders, but the degree to which state and local governments have adopted effective programs. In Rhode Island, which features a less inspiring renewable-energy program than its neighbor to the north, solar jobs grew 63 percent in 2013, from 210 jobs to 340. However, that increase dropped the state’s national rank in per-capita solar jobs from No. 21 to No. 26. Rhode Island Center for Freedom & Prosperity’s editorial cartoon take on the state’s renewable-energy standards.By focusing solely on the cost issue of the renewable-energy discussion, the one-dimensional report preys on family fears of not being able to pay bills or buy Christmas presents. The report claims the economic impact of maintaining RES mandates over the next six years will devastate Rhode Island. It predicts current energy mandates will raise the cost of electricity by almost $150 million for Rhode Island consumers through 2020; increase unemployment; reduce disposable income for families; and decrease private investment in the state. “Are these mandates worth a hundred families losing their jobs?” Stenhouse asked. Wow. That’s quite a doomsday scenario for attempting to reduce greenhouse gas emissions, modernizing the power grid and energy-resource ownership, and maximizing energy efficiency. In the meantime, the status-quo free market basically comes down to the five Big Oil companies doing what they believe is in the best interest of their shareholders. 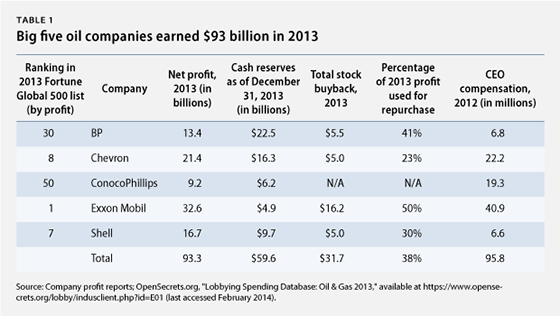 The 2013 combined profits for BP, Chevron, ConocoPhillips, ExxonMobil and Shell totaled $93 billion, but company executives are fighting to keep tax breaks and industry lobbyists are working to lift the crude oil export ban. Lifting the ban would likely raise U.S. gasoline prices. To back its claims that renewable-energy mandates will devastate Rhode Island’s economy and its families, the Rhode Island Center for Freedom & Prosperity report cities the work of Kelly Sloan, an energy and environment fellow for the Centennial Institute at Colorado Christian University. According to the institute's website, Sloan has years of experience in the oil and gas industry. The report references Sloan’s policy brief entitled “Bad Bargain: How Renewable Energy Mandates Pick Your Pocket,” which claims government mandates that require electric utility companies to use wind and solar power instead of more affordable hydrocarbons have left ratepayers with sticker shock in state after state. Sloan noted that wind and solar received more than $4 billion in government subsidies in 2010, more than 100 times the amount for coal, natural gas and nuclear. “Despite all the mandates, subsidies, tax breaks and loan guarantees, wind and solar accounted for barely 4 percent of total U.S. electrical generation in 2012,” he wrote. In neither of those two policy papers does the energy and environment fellow mention the importance of protecting the air we breathe, the water we drink or the soil that grows our food. Public health impacts associated with energy production are ignored. In the quest for U.S. energy independence, the “expert” cited by the Rhode Island Center for Freedom & Prosperity report that promotes the need for open and honest debate, fixates on protecting corporate interests, at least those of the fossil-fuel industry. For U.S. energy policy to adequately reflect the challenges of a changing world and climate, the conversation can't be held at the children’s table, in a boardroom or tied to a tree.